For Osage resident Lodema (Ball) Cockrum, her Grandma Heller had an attic full of treasures including an interesting quilt currently on display at the Mitchell County Historical Museum. Lodema's Grandma Ida Heller was born February 20, 1875 to William D. Osborn and Ruth (Bryan) Osborn in Greene County, Iowa. Ida had three brothers and six sisters. On March 18, 1896, she married Frank Heller. Frank and Ida farmed near Goose Lake. They had a lodge for local hunters. In 1914, they moved to Orchard, Iowa. Lodema's mother was Hazel (Heller) Ball. "One of the interesting facts about grandma's house was the size 24-feet by 24-feet," said Cockrum. "It was built by her son, Verl Heller, on the homestead in 1927." She has many memories of the attic. "Her attic always held a sense of wonder and adventure for curious children," she said. "The treasures she had brought with her found refuge in the attic." Lodema would beg to go up to see what she could find. "To discourage us from going up there, she would make a wide-range of excuses," she said. "They would include its too cold, it's too hot, you'll just make a mess, etc." On one particular trip, she found a sack containing quilt blocks. "They were just beautiful to a child with a wild imagination," said Cockrum. "I took them down to her to found out why they were there and to beg her to make me a shirt, vest, or something out of the pink shiny pieces. "She told me she should just 'throw those old pieces out, they weren't anything of value', just old pieces of corset material she had put together at the age of sixteen and had never done anything with them. "'Please, please, could I have them?' As my bottom lip took on a pathetic look, I was told to take them back to the attic." Cockrum added there were many treasures in the attic like an old feather tick on the bed that could "swallow you up and felt like the inside of an envelope," old camera equipment that her grandfather had used in his photography business, love letters he had written to her grandmother, and a letter that's written to her grandmother from a cousin that was written backwards. "I still have the letter," she said. "You have to hold it up to a mirror to read it." Her grandmother passed away in 1964 and Cockrum's parents bought the house. "The attic didn't lose anything, but gained to overflowing with more and more treasures," she said. Her mother passed away in 2001. Cockrum's brother and son came to help clean out the basement and attic. "Now, don't forget the size of this tiny house," said Cockrum. "We took 26 pickup loads to the dump. Loads of yarn, thread, crafts and too many things to remember were given away. "I found seven quilt tops which belonged to my grandmother and mom and also the precious sack of pink corset blocks." Cockrum said she sat down and cried because "they were the most beautiful quilt pieces. "They were now mine and I would not throw those 'old things' out." She decided her children and next generation would probably not do anything with quilt tops so she had them all made into quilts. "With the hope they will keep them," said Cockrum. When it came to her Grandma Heller's corset blocks, she asked a cousin to put them together for her. 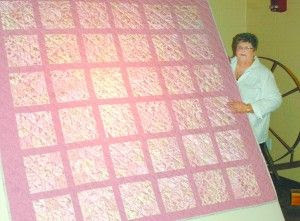 "She quilted the pieces that are 119-120 years old or older," she said. "They still shine brightly to the wide-eyed child who found the beauty in the treasures found in Grandma Heller's attic." Lodema (Ball) Cockrum lives in Osage, Iowa with her husband, Jim. They are now both retired and enjoy spending time with their grandchildren and family. Lodema and Jim moved to Osage after many years of living in Nora Springs, Iowa.